The Creative Arts Center comes to life each year at ArtsGala. Just over 20 years ago, Mary Ellen Mazey had a really good idea. After being named the dean of the College of Liberal Arts in 1999, she had attended several arts events and performances in the Dayton area at the urging of then-President Kim Goldenberg. While Mazey enjoyed each one, she and her husband left every dinner and show wanting something more. “I kept thinking, we have just such great arts programs at Wright State, why don’t we showcase those, because we can give something better,” Mazey said. “Our students and how talented they were — back then, that was the best-kept secret in Dayton. Not enough people knew about them,” said Jennifer Buckwalter, assistant dean of the College of Liberal Arts, who has served in the leadership role in planning ArtsGala each year since 2005. Mazey wanted to host something Wright State, and Dayton, had never seen before — a collaborative arts showcase to display the incredible talent of Wright State’s fine and performing arts students. It would be called ArtsGala. On April 13, 2019, ArtsGala will host its 20th event since its inaugural evening. 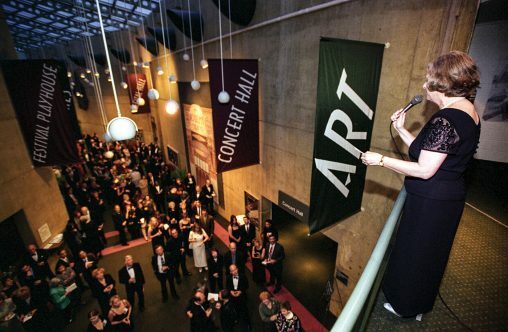 Mary Ellen Mazey, former dean of the College of Liberal Arts, welcomes guests to the first ArtsGala on April 1, 2000. She began contacting everyone within the College of Liberal Arts, including the provost, and fundraisers within the Wright State University Foundation, as well as Sharon Nelson, former associate dean; Stuart McDowell, then-chair of theatre, dance, and motion pictures; Victoria Oleen, managing director of the Department of Theatre, Dance, and Motion Pictures; Linda Caron, current dean of the College of Liberal Arts and then-chair of art and art history; Herbert Dregalla, then-chair of the Department of Music; and Wright State’s fifth president, Dr. Kim Goldenberg. “If it hadn’t been for all the people internally wanting to make it happen, it would have never happened,” Mazey said. Mazey’s goal for the first event was twofold: 1) make the community aware of Wright State students’ incredible talents, and 2) fundraise for scholarships for those students. 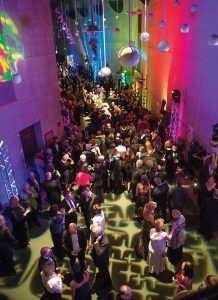 The first ArtsGala was hosted later that spring with Mazey spearheading the efforts, along with support from Goldenberg, an internal planning committee, and a host committee. “I think on the first event, I was delighted to see the turnout — it was just phenomenal. [The event] was on the first anniversary of when I was named dean and I thought, if this thing doesn’t go well, I’m a goner!” Mazey laughed. Since that first event, ArtsGala has grown into a magical evening where art is happening all around — theatre, dance, music, visual arts, and motion pictures, showcasing all the fine and performing arts at Wright State. More than 800 patrons each year enter the Commons of the renovated state-of-the-art Creative Arts Center and move from one themed dining room to another. They are treated to an aria in one space, jazz in another, or rock ’n’ roll down the hall. In the Stein Galleries, patrons talk with artists as they work and share their dreams. They can even watch a student film that may be heralded at a future film festival. “Peter Pan” was performed on the Main Stage during ArtsGala 2015. In the last several years, some incredible, high-ticket items have been at the silent auction. Patrons bid on packages, such as a trip to Rome to meet Tom Hanks on a set of “Angels & Demons,” jewelry, furniture, a grand piano, dinners prepared by local chefs, golf trips, and much more. One unique package in the auction’s earlier years was a lunch with actor Martin Sheen and a tour of “The West Wing” set in Hollywood. But any seasoned ArtsGala attendee knows that, even if you don’t snag a winning bid at the silent auction, you’re not going home empty-handed. Guests cannot leave the signature event without a miniature piano made from decadent rich chocolate. In fact, they are so sought-after, some attendees have even been caught stashing them in handbags to ensure they receive the coveted takeaway. While the night wouldn’t be possible without the patrons and donors, ArtsGala would also not be possible without the generous support of hundreds of volunteers, supporters, and sponsors. Many businesses and individuals have partnered with ArtsGala for years, having recognized the tremendous value of this partnership—for themselves, their businesses, and students. Most of the event’s details are handled by two large committees of volunteers and staff—the host committee and an internal committee. The committees’ main roles involve recruiting volunteers and attendees as well as making most of the decisions on entertainment, catering, and other logistics. Two of the original supporters of ArtsGala, Burt and Alice Saidel, serve on the host committee and were co-chairs in 2001 and 2009. 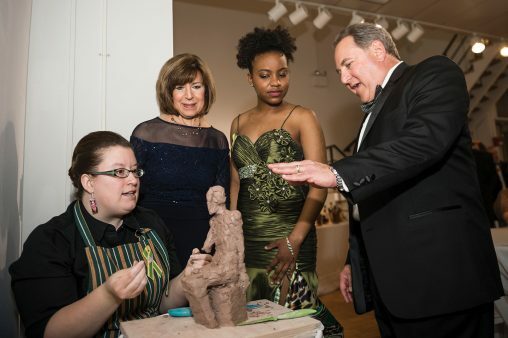 Alumnus Larry Klaben ’77, president and CEO of Morris Furniture Company, and his wife, Marilyn, learn more about sculpting from art student Ellen Bukvic ’15. In the last several years, many generous sponsors have supported the event, including Morris Furniture Company and Wright State’s Barnes & Noble Bookstore, both serving as presenting sponsors for many years. ArtsGala is an event Caron waits for all year. 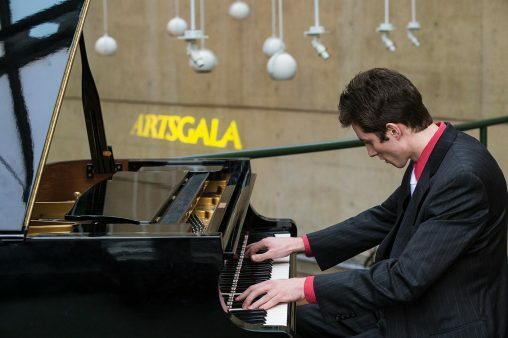 Since 2000, ArtsGala has raised more than $2.7 million in arts scholarships, equaling 765 individual scholarships provided for students, allowing them to see a future not only at Wright State, but into careers creating art. The scholarship money raised during ArtsGala is crucial for the College of Liberal Arts’ programs and students — helping departments attract and retain talented students, and maintain the college’s high-caliber programs. The college’s arts programs are rigorous and demanding. ArtsGala scholarships allow them to focus on studying and honing their craft, rather than worrying about working to fully fund their education. Mark Antony Howard, a sophomore acting major and recipient of an ArtsGala scholarship, said he is very thankful for the support. In honor of the 20th year, ArtsGala has taken the fundraising opportunities a step further by introducing a new society to significantly increase scholarship support for students and to honor the legacy the event has built in the community. The ArtsGala Society, developed by one of the original founders, alumnus Larry Klaben ’77, will include tickets to ArtsGala 2019, name recognition in the program, and an opportunity to meet the recipients of ArtsGala scholarship support. The two goals put in place by Mazey at the start remain constants. But, even as these 20 years have passed, Mazey admits she didn’t quite recognize what a huge success and premier event it would become. Music student Benjamin Geist ’14, ’16 delights guests at ArtsGala 2013. ArtsGala Scholarship Alumni: Where are they now?